Successfully Added Pokemon Power Bank - Authentic Poke Ball Design, 8000mAh Battery, Charges Two Devices At Once, LED Power Indicator to your Shopping Cart. Catching the Pokemon you’ve always dreamt of in the new Pokemon game, Pokemon go, starts with owning the right equipment. With this Pokemon Power Bank you will hold all the power needed to catch that majestic Lapras or mythical Snorlax without worrying about ever running out of juice again. Simply double click the authentic front button on this Pokeball Power Bank and unleash the monstrous power of this Poke Ball battery – with over 8000mAh the amount of electrical power this Poke Ball Power Bank holds even leaves Pickachu standing in awe. 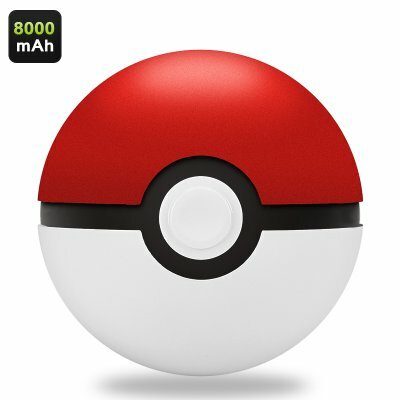 Engage up on your next Pokemon adventure in style with the number one Pokemon Go Accessory - with this Poke Ball smartrphone charger nothing will stand in your way to catch 'em all. With its authentic design and weight this Pokemon Power Bank fits perfectly in the palm of your hand and makes it feel like as if you were truly holding a real Pokeball – ready to support you on your next Pokemon adventure. Featuring a massive 8000mAh battery this Pokemon Power Bank holds power equivalent of four and a half fully charged iPhone 6 batteries. No matter what type of device you are using, this epic Poke Ball charger will provide you with hours of additional playing time and lets you continue your Pokemon adventure without being interrupted. Nothing beats a product that reflects your current passion for Pokemon Go in the most ideal way possible. This Pokeball smartphone charger is the ultimate companion for Pokemon Go players that like to take their adventure to an entire new level. With its two USB ports this magnificent charger is capable of charging up to two devices at once – allowing you to share your power will all your befriended Pokemon trainers in the area so that together you can conquer the world of Pokemon Go for hours to come. This Pokemon Power Bank is the perfect accessory for Pokemon Go players and enthusiasts world wide. With this Powerful and authentic PokeBall charger you’ll make sure that you and your friends never miss another rare Pokemon due to a dead battery again. Enjoy countless of hours of your favorite new Pokemon game and catch ‘em all with the help of this phenomenal Pokemon smartphone charger. The Pokemon Power Bank comes with a 12 months warranty, brought to you by the leader in portable power banks as well as wholesale electronic gadgets..
Arabic: - بنك طاقة البوكيمون - Chinese Simplified: - 宠物小精灵力量银行 - Czech: - Pokemon Power banka - Dutch: - Pokemon Power Bank - French: - Banque de puissance pokemon - German: - Pokemon-Power-Bank - Hebrew: - פוקימון כוח הבנק - Hindi: - Pokemon पावर बैंक - Hungarian: - Pokemon Power Bank - Italian: - Banca di potere di Pokemon - Japanese: - ポケモン電源銀行 - Korean: - 포켓몬 전원 은행 - Malay: - Menyeberang kuasa Bank - Norwegian Bokmål: - Pokemon makt Bank - Romanian: - Pokemon Power Bank - Russian: - Банк питания покемон - Spanish: - Banco de energía de Pokemon - Thai: - ธนาคารพลังงานโปเกมอน - Turkish: - Pokemon güç banka - Vietnamese: - Pokemon Power Bank.